The time is finally here as T-Mobile and the ISIS team prepares to officially launch their pilot Mobile Wallet application on October 22nd. 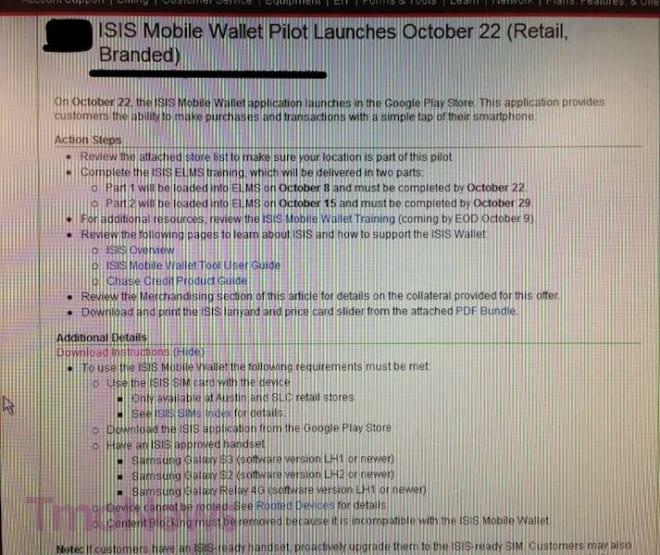 Thanks to this blurry-cam image, we can see that the ISIS Mobile Wallet application will finally makes its way to the Play Store on October 22nd. As of now, the pilot trial will begin in Salt Lake City, Utah and Austin, Texas. In order to use the ISIS Mobile Wallet service, you’ll have to use an ISIS SIM card with the Galaxy S III, Galaxy S III and Galaxy S Relay 4G smartphones. As an added bonus, the second image indicates a special offer for up to $25 in “ISIS cash.” That’s good for $10 when you activate your ISIS mobile wallet and another $15 if you convert the ISIS cash card to a reloadable prepaid card. We’re not exactly sure how the last part works, so we’ll have to wait for official word from T-Mobile and its ISIS partners. One interesting note is that the first image says specifically that “device cannot be rooted,” which is an unfortunate but not unexpected revelation. We’ll work to get more details as the ISIS launch gets closer. I’ve been waiting for this for a long time. I’ve never filed a federal complaint before but once they launch ISIS hopefully we can get formal FTC action against them for blocking Google Wallet. Google Wallet is a VASTLY superior technology and has been available for a long time. Regardless I will NEVER use ISIS. While I’m happy ISIS is coming, I’m still not sure I like my operator having ANY control of my mobile wallet. As much as I like t-mobile, I think they are the least bad of the major US operators and don’t trust them to have any say. I know all operators want to be more than dumb pipes, and can and should look to provide good value added services, but I’m just not sure money is an area I’m happy for that to occur with. For now i suppose, as my bank cards aren’t supported by ISIS, I suppose i don’t have to worry much. i wish it was for my Amaze, but strange it isnt for my new baby Galaxy Note II. I’m assuming you have the international version of the note 2…if that is correct what bands does the phone support on Tmobile? HSPA+ 42 or 21? on serious note, why can’t we use nfc instead of a special sim card for those phones with nfc capable? And shame on you tmobile for blocking Google wallet. This already exists in Android OS and iOS. Silly that T-Mobile thinks they need to make a duplicate service with added complexities like a special SIM card. I bet they’ll be shocked that most customers have no interest in this service. You should probably read up on the ISIS program before you talk about something you know not about. There is an article somewhere that says vendors will abandon the Android/iPhone payment systems on more than 50% of the market in favor of a duplicate service? Did you read who all is involved and why they choose to do this? This is why I said to read up before speaking. Takes less that 2 minutes to find, read, and comprehend the information regarding this ISIS program. I am not saying I prefer ISIS to Wallet or the other like systems, I am just saying the reasons for creating this are sound. I have read and comprehend the information regarding ISIS. The major carriers are building a duplicate/late to market service because they hope to make a lot of money from it and have the ability to block their main competitor from being installed. OK, I will go into a long into a long post about the reason ISIS and Google Wallet was brought about and the differences and benefits of each. Hopefully this can clear this up as well as some other “duplicate” programs in regards to many of Google services. Hopefully everyone can follow along and enjoy and maybe come out with a different angle to view such decisions, somewhat of a business view that is. First of all, yes money is the core of it all. But who benefits from a program like ISIS, Google or the ISIS group? Well believe it or not, everybody. Google, Isis, consumers, and device manufactures. Google has long been providing services and purchasing companies and technologies that seem a bit of a risky investment that have many asking “why?” The purchase of GrandCentral which later became Google Voice and was also wrapped up into GMail, Talk, and Messenger of Google+ is one example. The release of an off contract phone sold through Google called the Nexus One. All these critics have claimed as “Flops.” Yes, the Nexus One was not a great seller but even if Google did not sell a single unit the phone was a success. The company used this phone to kick start the other device manufactures into upping the game when it came to hardware specifications and OS update releases. The Nexus line has always been that, to introduce a new standard that other would be forced into adopting as well. This strategy is what keeps Android fresh and gets the newest technology into the hands of the consumer. Want proof, look at the new IPhone 5. Due to many different manufactures all competing to outdo the others the hardware race has quickly taken leaps and bounds over what Apple can keep up with. Because of this there will always be that juicy next Note 2 or PadFone 2 on the horizon. Google is an Operating System manufacturer not a phone maker, that is what so many forget when comparing them to other companies such as RIM or Apple. Like Microsoft Windows is a OS that can come on low end PCs and netbooks to High End PCs like Alienware or XPS line. So when Google released an OS with NFC capabilities into the world with an application to take advantage of this, it was to add that extra little something to get people interested in the Android option over what they are currently carrying. Now how many phones are out or coming out with NFC regardless if Google Wallet is supported on their carrier or not? Many is the answer, it is quickly becoming a staple with new phones. 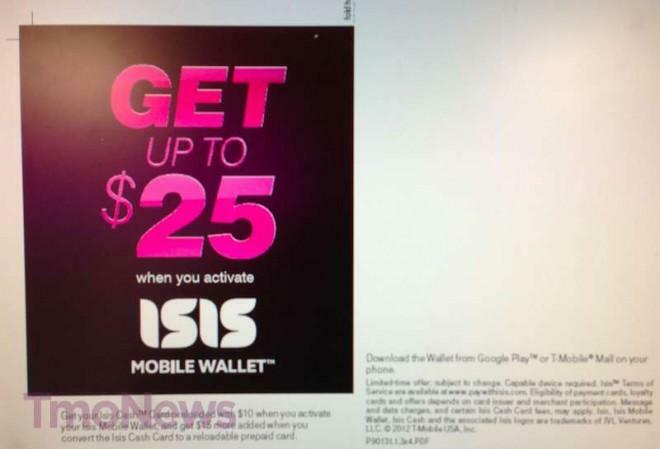 As for Google Wallet VS ISIS. Google honestly could care less if there is one, or a million duplicate programs out there. If there are options for the consumer to go to, then that means for Android devices getting out into the world, so a win for Google and the consumer. The ISIS group came about not only for the carriers to get their little piece of the pie and the profits, but it also came about because they want this very powerful system to run by their terms. This I do not blame them and in all honesty is a very smart implementation of the program. Now let me outline how this all works. Google as powerful as it may be, still does not have the ability to force mass conversion of credit/debit machines to NFC capable checkouts. With the founding of ISIS and the mass backing over major carriers, of which 90%+ of Americans use, there is more incentive for businesses to convert. Be it where you purchase products to the actual credit card companies. This will also help the consumer as well as make it more of the norm for an Android user to pull out his phone and swipe for payment. Again, presumably adding more Android powered phones to the pockets of Americans. Now on the legal side. If you were to lose your phone with Google Wallet and your stored CC information, what do you do. Well you better call your credit card company to put a freeze on that card. This is what ISIS does not want. They want to be able to provide just an added step of security into the mix. Because, if you lose your card or become a victim of identity theft there are certain legal rights you have and also certain legal obligations you must adhere to. Some of that money you lost you are still responsible for usually. With the added information on the new SIM cards ISIS partners can access the app directly. If you where to lose your phone with the ISIS app and the new SIM card, all you need to do is call your Carrier and have them remote wipe the app or CC info. Now there is no need to suspend your card. Also, this frees up your carriers from responsibility since the would be thief’s would essentially be using their technology and network to access your accounts. With ISIS it basically comes down to more security through multiple tiers, an increase in NFC locations and functionality, and more service options for the consumer. I really hope this can clear up a little bit about this all, and for those who read through this I thank you. The “special” sim card is for security purposes through nfc actually. I wouldn’t consider the security of my information to be a “complexity”. I went through the isis training and im hoping it does well. More features then wallet. No. The special SIM card is for locking down the service to special phones the carriers can control and monitor. NFC chips in the hardware are not controlled by the carrier. Thanks, but no thanks for the attempt at spreading the Kool-Aid. Sorry to bust your bubble, but consumers want carriers to be dumb-pipes. You should really do some research before commenting. The sim car holds the SE chip which is for security purposes. But hey believe what you want. ISIS is just another tool for these greedy carriers to increase revenue for their shareholders. It has nothing to do with security. NFC works fine without “special” SIM cards and “approved” phones. Want proof? See Japan. This means, T-Mobile / ISIS have chosen 2 devices approved by Mastercard, and 1 approved by VISA. Probably to gain experience with both? The T-Mo HTC Amaze is also in Mastercard’s list, approved for ISIS. No info about supported wallets in Visa’s list, but model number reveals a bit.